If the stretch limo just so happens to not be stretchy enough to fit your crew, some genius went ahead and stretched it out into something a bit more super. 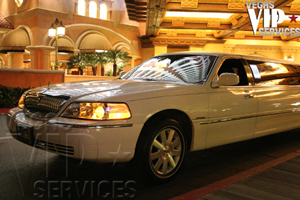 With a capacity of up to 14 individuals, the super stretch limo is the ultimate of stretch limousines. Despite the increase in seating space, you'll still have access to the same wonderful amenities of a stretch limo. With a simple touch of the limousines control panel, you can turn your ride from tame and quiet to loud and wild - with a hint of neon club lighting - in an instant. The vehicle's spacious interior will allow for some light grooving to the beats emanating through the vehicles built in surround sound system. An on-board DVD player and compatible MP3 docking station or auxiliary port allows you and your guests to fully customize the drive to and from your destination. Not sure what you'd want a DVD player for? Imagine starting the bachelorette party off with a little on-the-road adult entertainment or showing a birthday girl a little memoire of her life before the big event. A fully stocked mini-bar compliments this luxury space on wheels, ensuring that you and your large group of girls will be plenty liquored up by the time the festivities start. Since you'll probably spend most of the night divulging in alcoholic beverages, you'll have that added piece of mind that a ride home has already been arranged for you.